From 2006-2010, American rock band KSM was a project between the Walt Disney Company and The Go-Go’s. Around the same time, New Jersey band For The Foxes was making headlines with MTV Buzzworthy. When the two bands crossed paths, Katie Cecil and Anthony Purpura had no idea their futures would involve them making music together. A mutual friend of theirs was working on music with Cecil and introduced her to Purpura at a party in Los Angeles. An impromptu jam session had the rest of the party goers suggesting that they should create music together. There was just one setback – Cecil was living in LA and Anthony was living in New York. Their debut single, “Just Our Style”, was released in 2015. Compared to their latest single, “Kings”, the sound is different enough to prove that they’re coming into their own but still remains cohesive with one another. The newest track hooks you straight from the beginning, starting and ending with a feel-good vibe. The music video for “Kings” is completed and is said to have incorporated a variety of dance styles. It’s “very classic and very weird” according to Cecil. Nick Teti, formerly of pop band V Factory, now dances for several different projects and teaches dance classes, including a class that created choreography to “Kings”. After Teti danced in the music video, he created choreography for one of his advanced classes at Millennium Dance Studio in Los Angeles and invited Cecil and Purpura to check it out. What Purpura was not expecting was Cecil to show up in full dance attire and expect him to learn the choreography in his skinny jeans. While a video of this is up on their Facebook page, the actual music video has yet to be released at this time. From long distance to permanent residences in Los Angeles, Katie Cecil and Anthony Purpura are ready to begin a whole chapter of their story. 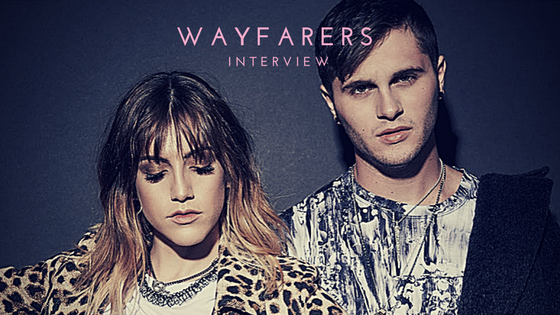 Wayfarers is still in the beginning chapters of their musical story together, but with their impressive backgrounds and long-term dedication, their story is one for the books.